24th June 1894, the President of the French Republic Sadi Carnot reached the end of his life in Lyon under the blows of a young Italian anarchist, Sante Caserio. The killing made a tremendous impact in France as well as in Italy and all over Europe. Though Umberto I and Crispi showed their execration and grief, people attacked a number of Italian shops in Lyons and in other French towns, and in Paris they even demanded to go to war against Italy. A ship of Italian emigrants on their way to America was compelled to avoid all French ports, while many fugitives terrified of reprisals started flocking into Turin. But Caserio’s attack had no nationalistic intent whatsoever. On the contrary, it was planned by its author as an act of solidarity towards his French comrades Vaillant and Henry who had been struck down by that State. Caserio’s attack should be reconstructed meticulously as it is quite significant, and reveals some interesting aspects of the anarchist movement. 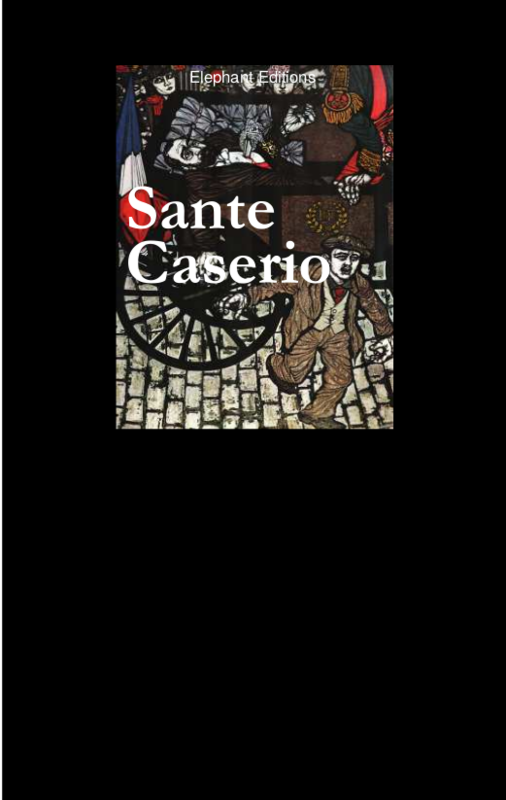 This is the story of Sante Caserio, a young Italian anarchist who refused to join the army and kill other exploited like himself, and emigrated to France so as not to be arrested as a deserter. There he stabbed and killed Sadi Carnot, the French president of the Republic, during a public celebration in honour of the latter in 1894. Why are we remembering Caserio one hundred and sixteen years after his death, which he faced on the scaffold after the killing of the president? There is more than one reason. First of all, we should never forget the acts of rebellion of the past, especially as they are often neglected by official historians or presented in the worst possible light. Secondly, the great importance of Caserio’s action is still valid even if it belongs to a quite different context than ours: Caserio, twenty-years old, the shy and diligent worker coming from a little village in the north of Italy, struck the very core of political power, the most prestigious symbol of French bourgeois society. Thirdly, Caserio’s act represents an excellent example to all anarchists who are fighting against the system in order to destroy it. We are not saying that the killing of whatever president of the republic is recommended (consider, in fact, that a new president would be immediately elected), we are just saying that propaganda by the deed is often more important than a million words. Discussion is necessary and worthwhile, of course, but translating the latter into actions is also necessary. This is true today as well as it was in Caserio’s time. At that time, working class living conditions were thoroughly miserable throughout Europe, while the great political powers were wasting huge amounts of money and lives in colonisation campaigns. A large number of attacks against the capitalistic and imperialistic establishment broke out all over the continent, but it was mainly in France that anarchists made some bourgeois blood flow. French anarchism, devoid of the powerful anti-monarchist incentive that had characterized Italian and Spanish anarchism, included a series of attacks against bourgeois society and the institutions of the French republic. On December 9 1893 August Vaillant threw an explosive device into the Chamber of Deputies. Although no one was killed he was sentenced to death on January 10 1894 and guillotined on February 5. President Carnot refused to show any mercy, in spite of a petition in favour of the condemned and a plea from his daughter. Vaillant went to the scaffold shouting an hurrah for anarchy and announcing that his death would be avenged. Seven days later, Emile Henry, another anarchist, launched an explosive device into the Café Terminus at Gare St Lazare, frequented by the bourgeoisie. One of them died and several others were injured. On May 21 1894 Henry also went to the scaffold. A number of explosions occurred between these two episodes. The Parliament suggested the introduction of special laws against anarchists, as had occurred in other European countries, but the series of attacks did not stop. On June 24 1894, one month after Henry’s death, the president of the French republic Sadi Carnot was to reach the end of his life in Lyon under Caserio’s blows. It was the revenge of the oppressed against the ruling class of exploiters, the desire to destroy the bourgeois system based on injustice and corruption and replace it with a new society without servants or bosses, poor or rich, armies or prisons. Caserio, a poor young worker, was one of the many oppressed, but he was also aware that the ruling class was made up of criminals whose hands were covered with blood, the poor people’s blood. He decided not to remain a passive spectator of the suffering inflicted on the proletarians; as soon as he discovered anarchist ideas he dedicated the remainder of his short life to spreading the ideal among people and putting it into action himself. In this sense Caserio is still an outstanding example to anyone who claims to be anarchist. 1894 was a year of great social disorder in France. French anarchism was actually deprived of the powerful anti-monarchist incentive which had on the contrary characterised Italian and Spanish anarchism, but expressed itself in a series of attacks against the system, bourgeois society and the institutions. On 9th December 1893, August Vaillant threw an explosive device full of nails into the Chamber of Deputies, injuring many people but no one was killed. The assailant, a very conscious rebel, but not a killer, was sentenced to death on 10th January 1894 and guillotined on 5th February. President Carnot refused to show any mercy, in spite of a petition in favour of the condemned and a plea from his daughter. Vaillant went to the scaffold shouting a hurrah for Anarchy and announcing that his death would be avenged. Seven days later Emile Henry, another anarchist, threw a deadly explosive device, which he had made alone, into Café Terminus at Gare St. Lazare. One person died and several others were injured. On 21st May 1894 Henry also went to the scaffold. A number of explosions occurred between these two episodes, not all were of anarchist origin but all terrified the capital. The Parliament suggested the introduction of special laws against anarchists, as had occurred in other European countries, but the series of attacks didn’t stop. On the contrary it was about to strike the peak of the political pyramid: on 24th June 1894, one month after Henry’s death, the President of the French Republic Sadi Carnot reached the end of his life in Lyon under the blows of a young Italian anarchist, Sante Caserio. The killing made a tremendous impact in France as well as in Italy and all over Europe. Though Umberto I and Crispi  showed their execration and grief, people attacked a number of Italian shops in Lyons and in other French towns, and in Paris they even demanded to go to war against Italy. A ship of Italian emigrants on their way to America was compelled to avoid all French ports, while many fugitives terrified of reprisals started flocking into Turin. But Caserio’s attack had no nationalistic intent whatsoever. On the contrary, it was planned by its author as an act of solidarity towards his French comrades Vaillant and Henry who had been struck down by that State. Caserio’s attack should be reconstructed meticulously as it is quite significant, and reveals some interesting customs and psychological aspects of the anarchist movement . One morning in winter I saw him near the Chamber of Labour in Milan, he was handing out propaganda pamphlets and bread to the unemployed workers. He had bought the pamphlets as well as the bread with his own savings. I never saw him even a bit drunk, which was quite usual among poor people, and he also smoked very little. As concerns juvenile vices, he was a puritan. One night he scolded a few friends of his who were coming out from a brothel: ‘How can you abuse these poor women buying their flesh and love?’. And as one of those guys, an opportunist, said: ‘At least we relieved a little of their misery with our money’, Caserio went in, gave one lira to one of the women, who looked at him in wonder, and went away without speaking. One day I asked him: ‘You’re a nice young boy, why don’t you make love?’. ‘I used to’, he answered, ‘but since I married the anarchist idea I’ve stopped going around with women, and now I’d like to find a partner for life, as I would like her to be’. He rented a flat where he used to give hospitality at night to all the homeless comrades in Milan. It was a real camp site, whereas he was at work in the bakery all the night. We knew Caserio in Milan, when he used to take part in our meetings and contrast our views along with some other anarchists. But he was not as insolent and arrogant as some of his comrades. On the contrary he was gentle, thoughtful and quiet, he was known as an affectionate boy and a very hard worker. His nature was deeply rooted in feelings of duty and sacrifice. The fact that he had been a very religious teenager confirms our opinion: he was not religious any more, but was still devout. The main feature of Caserio’s personality was his devotion to the anarchist ideal. He had been constantly worried about doing his duty properly and acting coherently with his ideas. On the one hand, as a little boy, he had found a response to his need of faith in the Christian doctrine, spirituality and maybe even poetry; on the other, as an adult, he found in the anarchist movement that family he missed so soon and in his comrades the people to whom he could give his great love. The chronicles describe him as a blonde, slim boy of average height, with blue eyes and quite an intelligent face: ‘his upper lip was shaded by some blond teenage hair, his eyes looked clever, his mouth was pink and fresh’. He first went around with the anarchist group of Porta Romana, then he himself created a group at Porta Genova, where they had a cubbyhole as a meeting place and even a red and black flag on which was written: ‘Anarchist-communist group a pee’, which means ‘broke’. On 26th April 1892 he was arrested for the first time for handing out the pamphlet Giorgio e Silvio, an antimilitarist dialogue, to the soldiers of Santa Prassede barracks in Milan. He was sentenced but soon let free again. At the age of nineteen he was called up to join the army. He fled to Switzerland to avoid being enlisted and was condemned as a deserter. He stayed in Lugano, where he found a job for a few weeks and also took part in a strike (August 1893). Later he moved to Lausanne, then to Geneva and finally to Lyons. In that town a strong anarchist tradition was still alive, so Caserio met some other comrades, but kept in touch with the Italian groups and received various anarchist papers from there. From Lyons he moved to Vienna and from Vienna to Cette (today called Sète), a sea-town south of Montpellier where many Italian workers lived. On Saturday 23rd June 1894 Sante Caserio worked as usual at the Viala Bakery in Cette till 10am. Following a stupid quarrel, deliberately aroused, with his boss, Caserio suddenly gave in his resignation and picked up twenty francs. One hour and a half later he bought a dagger for five francs from a local gun dealer who, lying, told him it was an authentic piece from Toledo. At 1pm he went into Café du Garde, took a look at the newspaper Intransigeant, and told everybody that he was going to Lyon. The day before he had known that the President of Republic would be in Lyon to inaugurate the Exposition, and he had decided to kill him. Lyon was far from Cette, so the customers of the Cafè not only didn’t suspect the young Italian’s intentions, they didn’t even believe he was moving to Lyon. At 3pm Caserio was at the station, took the train to Montbasin then, at 4pm, he caught the train to Montpellier where he arrived at 4.43. Waiting for the 11.23pm train to Avignon, he went and visited a friend of his, Laborie. He then caught the train to Avignon but he stopped at Tarascone. From there he changed class in order to take the only train to Avignon which was supposed to arrive at 2.04am. In the first-class coach the passengers looked with deep mistrust at that badly dressed and awkward stranger. In Avignon, Caserio, who had been working all the previous night, fell asleep for an hour on a bench inside the station. Then he asked for information about the time and money needed to arrive at Lyon. The time was enough, little more than four hours, but the price of the ticket, eleven francs and thirty cents, was beyond his means: he had only twelve francs. Had he bought the ticket to Lyon he wouldn’t have been able to buy any food. He then resolved to go to Vienne, nine francs and eighty cents, so that he could buy a piece of bread and calm his hunger. At 4.12am he left Avignon and at 9.45am he reached Vienne. Here he bought Le Lyon Républicain, cut the page containing the President’s day programme and wrapped it around his dagger. In Vienne he met a few people he had known when he had been in that town in 1893, among whom was a hairdresser who cut his hair for free and also gave him a glass of wine. At 1.30pm Caserio left Vienne and walked towards Lyon, a journey of 27km on foot. It was Sunday, a cloudy, rainy day. Caserio met some beggars, gendarmes, and farm workers. On his way he also bought a packet of tobacco and asked someone for two glasses of cold water. When he was near Lyon, he came across a bus adorned with tricolour flags full of people going to greet the President. Caserio only knew one spot in Lyons, Place de la Guillotière, and went there in order to orientate himself. The streets were all well-lit as the President was at the Chamber of Commerce for a banquet. Such a scene, made up of illuminations, parties, processions and music, gave rise to the most hostile feelings in the lonely assailant’s mind. At a certain point, Caserio, walking through the crowd, ran into a blocked road: the Presidential procession would go right there to get to the Theatre for the gala show. Caserio was on the wrong side though, as he had read that the President would go by carriage sitting on the right side, whereas Caserio was on the left side of the road. He found it difficult but in the end he slipped behind a wagon and got to the other side, where he gained a second row place among the throng. At 9.15pm the crowd started tossing around. First two horsemen of the Republican Guard passed, then it was the turn of some other regiments. The Marseillaise suddenly began to play, the President was approaching. Behind the last regiment the President’s coach came forward with two further horsemen on each side. The President, who was with the major and two generals, greeted the crowd. At that very moment Caserio sprang out, broke through the first row, jumped on to the footboard and stabbed Sadi Carnot. Many people thought that a man was making a plea, as they only saw the paper wrapping around the dagger and didn’t realize that the President had fallen down into his coach and was wounded to death. Caserio still had time to find a way out through the crowd, but instead he ran in front of the coach shouting: ‘Long live Anarchy! Long live the Revolution!’. Quickly the horsemen seized him and pulled him away from the anger of the crowd, while the President’s coach ran towards the Palace of Prefecture, where the President died not long after midnight. Judge: Accused, considering your childhood, nobody could have foreseen your horrible murder. You were a diligent and honest worker. But you were also impetuous, gloomy and too reserved. Caserio: Sir, I’m not responsible for being like this. Judge: You were once an altar boy, weren’t you? And you also used to appear in religious processions as young Saint John the Baptist, weren’t you? Caserio: Little boys don’t know what they are doing, they often do silly things. Judge: Isn’t it true that in 1892 you were arrested for making some anarchist propaganda among the soldiers? Judge: In 1892 you deserted and repudiated your homeland as well as your family. Caserio: The whole world is my homeland. Judge: Have you met with some well-known anarchists in Milan? Caserio: Should I have done I wouldn’t say. Judge: The police know that, even though you don’t say it. Caserio: The police do their work, I do mine. Judge: The prosecutor states you saw an anarchist hairdresser. Caserio: I couldn’t go to a baker’s to have my hair cut. Judge: You’re Italian, the attack was on 24th June, didn’t that day mean anything to you? Caserio: It’s Saint John the Baptist day, a holiday in my village. Judge: It is the day of the battle of Solferino, when Italian and French blood flowed together for the freedom of Italy. Caserio: I don’t accept civil war. Judge: You had no right to kill the President, there’s a natural law which prevents from killing! Judge: You said that had you been in Italy you’d have hit the King and the Pope, didn’t you? Caserio: Oh no, they never go out together. Only rarely did Caserio get upset, namely when the defence tried to show that Caserio’s family was mentally deranged. He was very sensitive about that. He also wrote a resentful letter to Podreider, his Milan lawyer, against such a line of defence that aimed to play down the political importance of his act. Podreider gave up Caserio’s defence as a result of that letter . Another reason for Caserio’s resentment arose when Mr Dubreil, his assigned lawyer, mentioned the ‘bad influence’ that Gori had on Caserio in order to mitigate the accused’s punishment. On that occasion Caserio suddenly interrupted his lawyer and shouted: ‘I don’t want you to insult my ideas!’. Caserio’s anger also aroused when they put forward the hypothesis of a draw: ‘We’re not soldiers, no need to pick a number! Anarchists are not subordinate to anyone!’. Caserio was then moved to tears when Mr Dubreil talked about his mother and his poor family. During the inquiry he had said: ‘I love my mother but can’t help moving away from the prejudice of family. A greater and more important family is humanity itself’. But Caserio’s feelings towards his mother, brothers and nephews were full of affection and his last thought was for them, as is proved by the letters he wrote from the prison . During the trial, Caserio answered various questions using his memorial that was read at the end of the trial. The memorial contains the essential reasons for his act: it is evidence of his beliefs, just as Vaillant and Henry’s declarations were to become anarchist propaganda texts after their death. Caserio cared a lot about his memoir which he wrote in his Italian Lomellina  while he was in prison. When father Alessandro Grassi, the priest of Motta Visconti and only person of that village who went to Lyon for Caserio’s trial, visited him in prison, Caserio read his memoir to him . The poor priest tore his hair out, perhaps because of the style of Caserio’s text, perhaps for its content, and said to him: ‘Tear up these pages of yours, I’m writing down a few lines for you which will make a good impression on the jury’. But Caserio was absolutely adamant, and refused. During the trial an interpreter read his declaration whose publication was forbidden by the Court following a bill passed in France a few days before. In Italy, on the contrary, Caserio’s declaration was published as one of the journalists at the trial, the correspondent of the Milan newspaper ‘La Sera’, was able to write it down in shorthand. Caserio’s text can’t be compared with Vaillant and Henry’s revolutionary eloquence, but it reveals his mature judgement and his ability to express it in a simple and clear way. First of all he talks about his own experience and the suffering he shared with other proletarians: hunger, unemployment, forced emigration, pellagra, low salaries, meagre and bad food, long working hours. On the other hand he saw ‘big shops full of clothes and woollen fabric as well as storehouses full of wheat and corn’ and then ‘plenty of people who didn’t need to work and produce because they lived thanks to the hard work of poor people while they had huge luxury houses with many rooms, twenty or thirty horses, many servants and any of the pleasures of life.....’. The comparison between the two categories made Caserio aware that society was not fair at all, that’s why he got rid of all the idols and beliefs he had grown up with. ‘I used to believe in God, but when I saw such inequality among human beings, I realised that it was not God who created men, on the contrary men have created God in order to keep people ignorant and make them respect private property’. As concerns the homeland Caserio, who was compelled to leave first Motta Visconti in order to find a job and then Italy in order to escape conscription, came to believe that ‘there’s no homeland for us poor workers. Our homeland is the whole world.’ In his final years what struck him most was Vaillant and Henry’s condemnation, what disgusted him most were the France-Russia alliance great celebrations in Paris, Marseilles and Tolone. Caserio didn’t save anyone among the ruling class, neither kings, presidents of the republic, generals, ministers, deputies or trade union leaders. And he ended: ‘Members of the jury, you are representatives of bourgeois society; you want my head? Well, take it, but don’t think you can stop the anarchist idea’. The trial lasted just one day, 3rd August 1894, and Caserio was indifferent to the death sentence. He was ready for that and refused to sign an appeal to the Court, even although he could have done as at the beginning of the trial the judge had pronounced an inadmissible speech aimed at influencing the jury’s final decision. He also refused to sign any petition for mercy and finally he refused any religious consolation to such an extent that he claimed he was a Jew in order to avoid the priest’s insistence. The execution was carried out by Deibler, the executioner, who had come to Lyons for that purpose, exactly at 4.35am, just before dawn. About three thousand people witnessed it: workers going to or coming from work, lovers of night life, drunk men, curious persons. Caserio faced the scaffold with great dignity but when he was next to the guillotine he jumped with fear, took a step backwards and cried in his dialect: ‘A voeri no’ (I don’t want), at least so they said. But he soon recovered and accepted death. As soon as the execution was over, a little applause came from the crowd which had been silent until then. Who cut off his head. At that very moment a prisoner in St Paul Prison shouted: ‘Hurrah for Anarchy, damn Deibler’. The prisoner, a poor thief, was soon identified and put in chains. Umberto I (1870-1900) was king of Italy from 1878 till his death in Monza as a result of the attack by Italian anarchist Gaetano Bresci. Francesco Crispi (1818-1901), an Italian politician was twice head of government: from 1878 to 1891 and from 1893 to 1896. His politics were authoritarian and aimed at suppressing the claims of the working class. On Caserio’s attack see: J. Maitron, Le mouvement Anarchiste en France, Maspéro, Paris, 1975 ; C. Molaschi, Attentati e attentatori. Caserio, in Pagine Libertarie, Milano, 30/9/1921; Folgorite, Ricordando. 24 giugno-16 agosto 1894, in L’adunata dei refrattari, 15/81925. Ada Negri (1870-1945), poetess and primary school teacher, suddenly became famous with the publication of her collection of poems Fatalità, in which she gave voice to the sufferings of the Italian working class at a time of violent social disorder. Soon after the attack, Caserio’s enemies tried to get Ada Negri involved in that deed as she was a well-known socialist supporter. A Venice clerical magazine wrote that ‘Ada Negri is part of that criminal group of writers which is responsible for the current corruption of our society’. See Il Secolo, 30/6/1984. P.Gori, Sante Caseario, in The Torch, London, 18/6/1985, in Opere, IX (Pagine di vagabondaggio), P. Binnazzi, 1912. In his poetry book Amore ribelle, Gori also wrote in verse Caserio’s declaration about women: ‘All’amor tuo, fanciulla /altro amore io preferia:/è un Ideal l’amante mia/ a cui detti braccio e cor’. (To your love, oh maiden/ I prefer another kind of love:/ it’s the Idea my lover/ to her I gave my heart). On this subject I also found a very interesting report in L’Amico del Popolo, Milan, 5/12/1891: ‘We communicate to the comrades who are waiting for the pamphlet Amore e rivoluzione (Love and Revolution) which was to be published in Turin, that it won’t be issued for the moment, as no printer is prepared to print it. In order to satisfy so many requests though, a few Milan comrades, in agreement with the Turin comrades, will soon print the pamphlet ‘Amore e odio’ (Love and hate), which we hope will properly replace the other one. Address your request to Sante Caserio in Milan. In his article Le lettere inedite di Caserio (Caserio’s unpublished letters), in La Sera, 11-12/71894, Guglielmo Ferrero wrote about the lack of any reference to love relations in those letters: ‘Love requires a great deal of moral and physical energy: those who can save such energy have at their disposal such a remarkable amount of strength that they have to expend it in some other way’. Filippo Turati (1857-1932) founded the Italian Socialist Party following the split in the Workers Party during the Congress of Genoa in 1892, which also gave birth to the Italian Communist Party. F.Turati, Il loro duello. L’uccisione di Carnot, in Critica sociale, 1/7/1894. I draw this information from Ernesto Caspani, Sante Caseario. Testimonianze, in Il Libertario, Milano, 30/7/1947. I read your telegram and reply that I don’t want you to let people believe my mother and my brothers are mad as they have never been mad, nor am I even if I’m in prison. It’s not because I’m mad that I killed the President but because of my anarchist ideal. I can accept a defence of yours if it considers my being an anarchist, not if it is set out as you say in your telegram. One of Caserio’s letters to his mother was published in Il Corriere della Sera, 6/8/1894. Some other letters which were published in La Tribuna (Roma) had been already been printed in the anarchist magazine Il Pensiero (Chieti), 22/7/1894. Lomellina is a region in Lombardy (Italy). This priest, who went to Lyon from Motta Visconti and visited his former parishioner and altar boy six times not only to comfort him but also and mainly to get him to show regret, was a quite pathetic character. Father Alessandro Grassi came out defeated from the confrontation with Caserio, except when he told Caserio that his mother wanted the priest to give her son a kiss from her. First Caserio resisted (‘I don’t want to be kissed by a priest’), then he accepted that kiss. See Don Alessandro Grassi e Caseario, in La Sera, 8/81894; Le impressioni del curato di Motta Visconti sul Caserio e il suo processo, in Il Corriere della Sera, 8/8/1894.